Friday, November 2 and 16, 6:00 – 9:00 p.m.
Let’s give a HUGE SunBird welcome to DJ Mikey Mike! Unleash your inner rock star, bring your singing voices and join in for a night of fun! Purchase your favorite drinks from the bar. Everyone is welcome! Friday, November 2 and 16, 6:00 p.m. If you are someone who would like to meet others from the community or just have a fun time playing Bingo, you might want to check into the Chandler SunBird Lions Club “Bingo Nights” on the first and third Fridays of each month. Bingo nights are played in the Ballroom at the SunBird clubhouse. Cards start being sold at 6:00 p.m. promptly, and the games begin at 6:30 p.m. You can come early to secure your seats. Come join us in the fun. The money raised goes to the SunBird Lions Club for the local charities. Doors open 5:00 p.m.; movie begins 6:00 p.m.
Friday, November 9, 6:00 – 9:00 p.m.
Bring your dancing shoes for a fun-filled evening with Jamal. This will be dancing music only. Purchase your favorite drinks at the bar or one of the drink specials. Everyone is welcome! Saturday, November 10, 8:00 a.m. – 1:00 p.m.
Be a part of the SunBird Community Garage Sale – open to the public. If you would like to participate and be on the map, please register at the HOA Office by Friday, November 2. Maps will be available on Thursday, November 8. Enjoy a night of dancing to one of the top Country dance bands. Reign-N-Country plays classic and new country, a little classic rock and a little oldies rock, but most of all, they just have a whole lot of fun! A full cash bar will be available. Tickets are currently on sale at the HOA office for $8 pp. Sunday, November 11, 11:00 a.m. Thank you to all of our SunBird veterans for your sacrifice and service. We would also like to give a great big thank you to Jodi and Betti Sue Perkins and all of those who participated to make this program possible. Bus Departs SunBird 8:00 a.m.
A trip south of the border to Algodones, Mexico, where you will have approximately four hours to spend the day as you wish. Take advantage of discount prescriptions, dental and eye care; enjoy a delicious lunch, shopping or just enjoy the festivities of this quaint Mexican town. For those who wish to spend the day at the Quechan Casino instead of Mexico, the bus will have a drop off there as well. Passports required for attendees going to Mexico. Bus departs SunBird approx. 8:00 a.m., returning approx. 8:00 p.m. $40 includes bus transportation. Does not include driver gratuity. Deadline for registration is Friday, November 9. Wednesday, November 14, 11:00 a.m. – 2:00 p.m.
Stop by the SunBird Ballroom and check out the local vendors, clubs, classes and more! Have lunch on the patio while enjoying music by DJ Mikey Mike! Raffle prizes, freebies from participating vendors and much more! This event is open to the public. To donate good quality auction items, such as tickets to attractions, vacation destinations, exercise equipment/bicycles, dinner and drinks in a private home, golfing equipment, etc., contact Marsha Brockish. CRAB Tournament follows on Saturday, November 17, with an 8:30 a.m. shotgun start. Saturday, November 17, 6:00 – 9:00 p.m.
Live in the Horizon Room; come see Kenny G get his groove on! From Motown to Hip-Hop, come dance and sing to his diverse playlist. This will be a fun night you don’t want to miss! Wednesday, November 21, 10:00 a.m.
Join Layne for coffee and pastries. 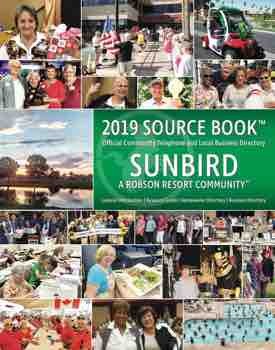 He’ll update you on what’s going on in the upcoming months, as well as the progress of the projects happening in SunBird. Bring your questions and he’ll find the answers. Thank you to Harmony Medical Care for providing the coffee and pastries! Friday, November 23, 6:00 – 9:00 p.m.
Let’s give a HUGE SunBird welcome to DJs Jeff & Sandy! Unleash your inner rock star, bring your singing voices and join in for a night of fun! Purchase your favorite drinks from the bar. Everyone is welcome! Sit back and watch the Canadian “Superbowl” on the big screen! Ticket price includes snacks, burgers, sides and dessert. To register, contact Mike and Susan McMillan at msmcmillan@rogers.com. Bring your singing voices and join in for a night of fun! Purchase your favorite drinks from the bar. Singers may sign up for karaoke. If no one signs up, Mark and Toni will play dance music. Everyone is welcome! Bus departs SunBird 3:30 p.m.
Everyone loves a parade, right? But a parade that floats is even better! Join us on December 8 as we watch a procession of festively-decorated boats at the 19th Annual Fantasy of Lights Boat Parade. While there, enjoy some holiday shopping, grab a bite to eat, enjoy refreshments while listening to live music and maybe even get your picture taken with Santa! The bus will depart approximately 9:00 p.m. Bus departs SunBird 4:30 p.m.
Join us as Dream City Church presents one of America’s largest Christmas musicals. Celebration of Christmas is a Broadway-style musical theater performance features a full live orchestra and state-of-the-art technology with incredible special effects. Culminating in a beautiful nativity with a majestic kings’ procession, this year’s show includes exciting new dance numbers, professional acrobatic silk artists, awe-inspiring aerial stunts, flying angels, and so much more! Saturday, January 19, 2019, 6:00 p.m.
Start saving your quarters; you may just have to see it to believe it. This event is going to be a blast! Stay tuned for further details! Check out our new Tuesday Dinner Menu and our specialty dinner of the week! Badminton, 7:00 – 9:00 p.m.
Join in on the fun at 4:00 p.m. and cheer on your favorite horse! Please bring $1 bills! Trivia Night with Sherlock Homes, 6:00 p.m.
A new season of Trivia is underway every Thursday at 6:00 p.m. in the Horizon Room. There is a maximum of eight players per team. Your team table can be reserved by the week, month or year at the HOA Office. Appetizers will be available to order. Fish Fry, 3:00 – 6:00 p.m.